Reader Finbarr Barry sent this photo from Dublin Airport at 7:50am this morning. PASSENGERS INTENDING to travel via Dublin Airport this morning have been advised to expect some delays to outbound and incoming flights. The delays follow inclement weather conditions, with significant snowfall and sub-zero temperatures at the airport this morning. Flight operations at the airport were suspended for 30 minutes this morning to allow the de-icing of the runways. Flight radar records showed up to ten flights being held in holding patterns above the airport awaiting clearance to land. Passengers are advised to visit the airport’s website to monitor the latest activity at the airport. The latest weather reports for 8am showed temperatures of -3°C at the airport. Email “Airline passengers warned of snow delays at Dublin Airport”. 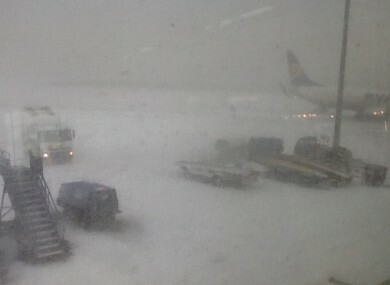 Feedback on “Airline passengers warned of snow delays at Dublin Airport”.